Fig. 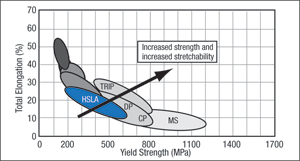 1—The arrow indicates the higher strength and higher total elongation of the AHSS compared to traditional HSLA steels. columns review successes or failures of the past year. Others provide suggestions on how to improve (insert your own topic) during the coming year. This month’s column will present some metalforming statements that sound technical but are incorrect. Oversimplification can create a wrong statement. Others may originate from press-shop legends or war stories. Some were not proofread. The following statements need to be corrected regardless of the source. • Stamping AHSS (advanced high-strength steel) can be challenging, as it has a higher strength and lower formability than conventional steel. The first problem is the definition of conventional steel. One can als set up an undefined apples and oranges comparison and make whatever argument they wish. If you limit conventional steel to aluminum-killed draw quality (AKDQ) or the current designations of forming steel (FS) and drawing steel (DS), high-strength low-alloy (HSLA) steels will have higher strength and lower formability. Unfortunately the author is comparing a high-strength steel against a low-strength steel—apples versus oranges. • Cold working sheet steel work-hardens the material. much does the stress (strength) increase as the material is strained (cold worked) during forming in the press? 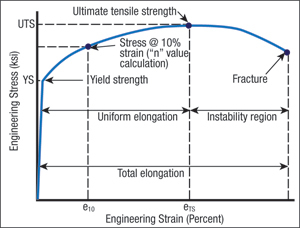 Second, how much does the strain (deformation) increase as the applied stress (load) is increased in a tensile test? The terms load, stress and strength are used and not hardness. Stretching is tensile elongation of sheetmetal in one or more directions that result in a reduction in the sheet thickness. Bending creates a deformation on the convex surface of the sheetmetal similar to a tensile test specimen. In contrast, most hardness tests force an indenter of a specific shape and load into the material to create a crater whose diameter is then measured. A harder steel creates a smaller crater. While the hardness test does not correlate well with stretching and bending, it is an excellent predictor of wear resistance. Why then is increased strength during cold working called strain hardening? The early days of blacksmiths, press shop workers and metallurgists needed to measure how cold working changed the characteristics of the steel. Different types of hardness tests were readily available and easy to use. Therefore, work hardening became the term to use. With the current science of forming, the term really should be work strengthening. Changing the term work hardening probably is not going to happen. However, we should als think work strengthening and forget the hardness test. • All forming of AHSS must be made in the first hit because the steel work hardens, becomes brittle and fractures. This statement has two problems. First, designing the AHSS forming process to maximize the amount of deformation in the first die is an excellent goal. However, the statement implies that further deformation in a second or later die is not possible because the steel work hardens too much in the first die. The material can withstand multiple forming operations until the sum of the deformation reaches the forming limit curve. The first problem occurs when the part is removed from the first die. Springback can be excessive and variable, which makes proper fitting into the second die difficult. A much larger force is required to resume deformation in the previously highly deformed zone because of the greatly increased yield strength. Other less deformed areas with lower yield strengths now may initiate unwanted deformation. The forming problems with AHSS are similar to those found with HSLA steels but usually are a much greater magnitude. The second problem with the statement is the AHSS work hardens and become brittle. The amount of total elongation may be small for some of the higher-strength AHSS (Fig. 1). The local necking alongside the fracture line may be minimal. However, a metallurgical evaluation of the fracture zone will show a cup-and-cone fracture surface of ductile steel. The actual failure mode at the fracture surface determines ductile or brittle failure—not the amount of deformation. ¡Excelente! gracias por compartirlo, ¿pero entonces es normal obtener altos valores de n para bajos valores de dureza?